In a word: Why eat at Himal Chuli? Because it's there. JM ate the beef buff with white rice and dal. Jim ate the chicken chili with dal and a chiya. Monnie ate the chicken palau with dal. Nichole ate the tuck-pa with momo and a chiya. The bill was $51, or $12.75/person, plus tip. JM and Nichole gave Himal Chuli an A-; Jim and Monnie gave Himal Chuli an A (see our grading rubric). It didn't help that the capacity of the already-tiny place is cut down quite a bit in winter, when outdoor dining is not an option. However, hardly any prospective diners left when faced with the crowd. 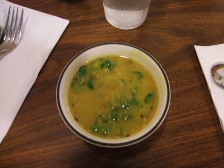 The dal we had for starters was rich and hearty, not weighed down by any one flavor. The roti was amazing - warm, slightly salty, light and toasty. JM's beef buff was boffo. The dish was filling but didn't leave him overstuffed. The veggies were lightly prepared, while the beef was chewy but nice. The chili chicken Jim ordered (graciously - he had his eye on the tuck-pa, but let Nichole order that) was as spicy as advertised. It was very salty (in a good way) and reminded him of "lettuce wraps," only super-spicy. 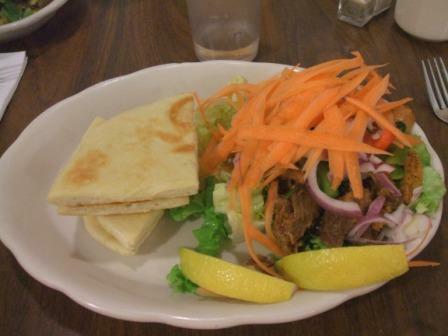 This dish was very colorful, with red peppers, carrots, lettuce, onions and bright wedges of lemon. Monnie's chicken palou, recommended by the server when they were out of chicken buff, had a very good, mild flavor. 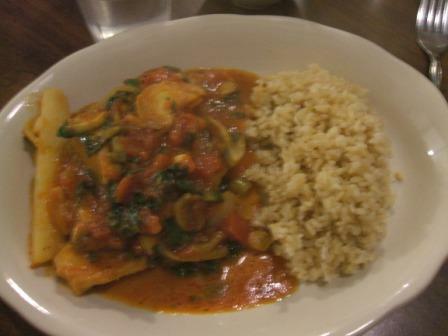 The spinach, mushrooms, and onions in a chunky tomato base over brown rice also included yummy garlic pieces, but the dish itself wasn't super garlicky. She noted that it was a perfectly balanced meal of meat, veg and whole grain (and she knows what she's talking about). The menu described the tuck-pa as a spicy shepherd's stew "especially bracing in cold weather." Nichole agreed that the spiciness was pretty invigorating (the milky chiya came in handy). More like a soup than a stew, the dish had real depth beyond its heat. 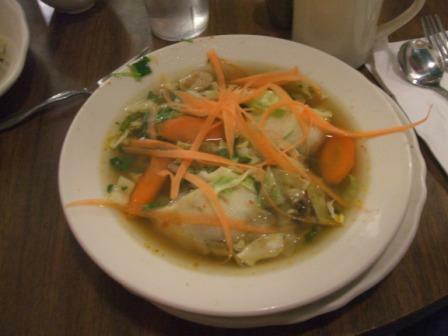 A clear, rich broth with cabbage, carrots, and green onions surrounded steamed dumplings which were very filling. The raw carrot shreds used as garnish were pleasantly softened by the hot soup, and the whole presentation was very nice. There were some rough spots in our experience, though. We were short on water through most of the meal, which was a challenge given of the spiciness of the dishes. That, and the earlier annoyances, added up - but as Jim reiterated, the food was really good: "There's something to be said for a place whose food can overcome those annoyances." We wouldn't recommend Himal Chuli as a first-date-type place, or somewhere you'd take a large group, but for simple, fortifying veggie-friendly food that will expand your comfort zone, it hits the spot. As a vegetarian, Himal Chuli is one of my favorite restaurants in Madison. I do know the annoyances of which you speak, though. I usually go at off-peak hours, and it's a much nicer experience. I often wonder why they haven't expanded much, but perhaps they are content with the success the have and don't wish to grow. Who knows? I think Chautara, just a few doors down, is owned by a family member of the Himal Chuli owners. 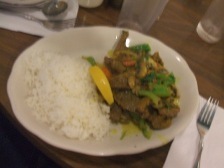 It's more expensive, but the food is comparable and the size and service are a little better. I still dream about that dal. We actually had the same conversation while at dinner: why haven't they expanded? Part of the charm of Himal Chuli is that it is hard to get a seat. You are there guest in their kitchen, be respectful and they will return the favor. The food is primarily vegitarian, thus the menu, vegitarian and non-vegitarian. They have expanded. Next door. Same owners different menu. Himal Chuli is never fancy, but never pretends to be. They serve great food with little fuss. If you want a big hunk of meat on a plate this in not the place. It is lite, but satisfieing. They always great me with a smile and a hot cup of Dal. I took my wife to Himal Chuli for our first date more than seven years ago. We have a very happy marriage and remember Himal Chuli very fondly. I think it was a great place for a first date.